Having already been one of the biggest rolling stock exhibitors at InnoTrans 2016 Stadler, which manufactures in Switzerland, Germany, Spain, Poland, Hungary, Belarus and the United States, is going even further at InnoTrans 2018. Stadler won this contract with Siemens, its consortium partner, in December 2015. The order for 106 trains consists of 21 two-car multiple units and 85 four-car multiple units. The first of these latter trains to be completed will be on display at InnoTrans. Measuring 73.6m in length, these vehicles can seat 184. They have been specifically designed for Berlin’s needs. This four-car multiple unit is powered by 750V DC via a third rail. 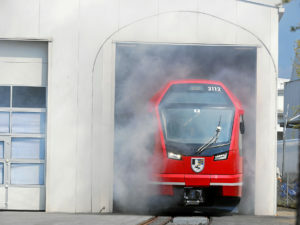 It is the first train on this network to be equipped with air-conditioning. In addition the new information system will give passengers details about the route. Stadler has not just been responsible for the design and development of these rail vehicles, it is also in charge of the production of car bodies, doors and the air-conditioning units as well as the assembly of all the components. Consortium partner Siemens is supplying the drive and braking systems as well as the electrical equipment. These urban-suburban trains, built at the Stadler plant in Berlin, will enter service in the capital in 2021. Havelländische Eisenbahn (HVLE) ordered ten EURODUAL locomotives from Stadler in March 2017. The contract also included full maintenance services. Intended for goods transport within the country, HVLE was the first client that chose the six-axle locomotive with bi-mode drive. The locomotives have a maximum of 2,800 kW for diesel/electric operation and 7,000 kW in electric mode. They can reach a top speed of 120 km/h. The EURODUAL is very versatile as it can be used on both electrified and non-electrified lines meaning planned routes can be more direct. The EURODUAL locomotive also boasts excellent environmental credentials with 97.7% of its components being reusable over its life-cycle. Delivery for this locomotive will begin in 2020. In 2014 rail vehicle leasing company Transitio signed a framework agreement with three suppliers to procure regional rolling stock. In April 2016 then it ordered 33 electric double-decker trains for Swedish railway company Mälab. The contract allows for a supply of an additional 110 trains. These trains will enter operation in May 2019. The updated double-decker trains, consisting of four cars, can carry 357 passengers. They have an improved design that allows for better passenger flow around the doors. Able to reach a top speed of 200 km/h, these trains have also been adapted especially for the Swedish market. They comply with Swedish clearance requirements and are able to run in temperatures as cold as -40ºC and in snow 80cm high. The trains have heated floors and walls while the underbodies were designed with the aim of preventing freezing to the maximum extent possible. In June 2016 Südostbahn (SOB) in Switzerland ordered 11 electric low-floor multiple units from Stadler so that it could replace older rolling stock when timetable changes are put in place in 2019. Part of the FLIRT range, the TRAVERSO features an intercity front. The bogies have been designed to maximise passenger comfort, while cutting-edge technology will ensure energy-efficient operation. To further increase the customer experience, the TRAVERSO has been equipped with large panoramic windows to allow passengers to enjoy the scenic views along the route. Each of the eight-car trains has capacity for 359 passengers, with 68 seats in first class. The TRAVERSO has a top speed of 160 km/h. Starting in December 2020 SOB will run the TRAVERSO on the Basel-Zurich route and across the Gotthard to Ticino, allowing passengers to choose what Stadler train to travel on: the TRAVERSO, with its outstanding mountain views, or the high-speed Stadler SMILE (Giruno) through the Gotthard Base Tunnel. In March 2016 Stadler won a tender to supply 17 underground trains for the Glasgow Subway together with its consortium partner Ansaldo STS (now part of Hitachi Group). These METRO trains will be capable of fully-automatic, unattended train operation and will be the first time Stadler rolling stock will be used in a driverless subway system. The Glasgow Subway has a length of 10.5km, it has 15 stations and it features a narrow gauge track of 1,219mm, while the tunnel gauge is just 3.4m in diameter. The rolling stock provided by Stadler will have to be adapted to fit these dimensions. They will be 39m in length, the same length as the rolling stock they are replacing, but they will be four-car instead of three-car units. Their top speed will be 58 km/h and they will enter commercial operation in 2020. In June 2016 regional Swiss transport operator RBS ordered 14 suburban trains from Stadler to run on the network’s S7 line between Berne and Worb. The four-car electric multiple units Stadler will be providing will run at a top speed of 100 km/h. They provide seating for 102 passengers and standing space for a further 380 passengers on the 20-minute route. Switzerland is one of two European countries that still makes extensive use of metre-gauge tracks (Spain being the other). These trains will be the first to feature eight rather than six sets of doors on this gauge in Switzerland. There will be a lot of open space around the entrance areas to make room for passengers with pushchairs, wheelchairs and suitcases. These trains will enter operation in late 2018. Stadler won a contract to build and deliver 14 three-car and 24 four-car bi-modal FLIRT trains as well as 20 twelve-car electric FLIRT trains for train-operating company Greater Anglia (Great Britain) in October 2016. This order is set to replace Greater Anglia’s existing regional, intercity and Stansted Express rolling stock in a bid to make train travel faster and more reliable in the region. The new Stadler trains will provide seating for 20 percent more passengers, while the low-floor design will make them accessible to passengers with restricted mobility. The trains will provide customers with a number of desirable features such as WiFi as well as USB and 240V sockets at every seat. Additional features include air-conditioning, bicycle spaces and fully accessible toilets. The bi-mode version of the FLIRT family will be on display for the first time at InnoTrans 2018. Financed by Rock Rail East Anglia, the vehicles will be leased to Greater Anglia by Rock Rail. Delivery will commence in 2019.